Volpin Props: Daft Punk replica Q. & A.
Daft Punk replica Q. & A.
WOW! 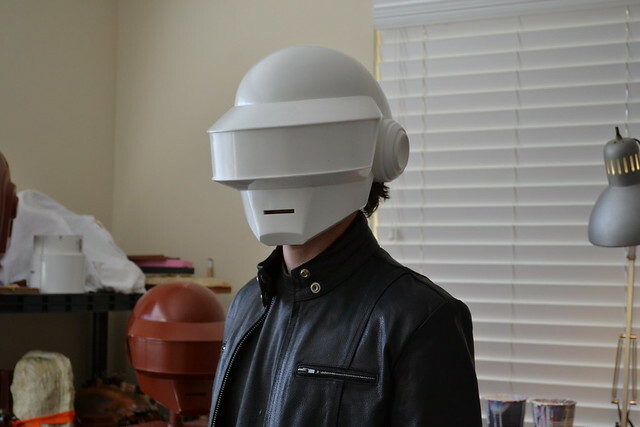 I have been getting a TON of requests/inquiries about the Daft Punk helmet. Most of these emails have very similar questions, so I figured I'd make a quick Q&A post that I can reference which will hopefully answer everyone at once. If you don't want to read all the copy below, I don't blame you. I do tend to ramble. Summary: I don't build things for money. I enjoy the process, the creative output, and the feeling when a new build comes together. This is the primary reason you see me decline so many offers for Portal guns, Daft Punk helmets, and anything else I've made in the past. I already have a 9-to-5 job that offers a multitude of repetitive tasks. I have absolutely no interest in turning my hobby into the same thing. Due to this, I only have intentions to build a handful of the helmets, then step away and let other people try their hand at creating these glittering buckets. Q: Is the helmet for sale? A: No, this helmet was built for a client of mine and was constructed specifically for him. Unless he wants to sell it (not likely!) it is not available for purchase. Q: Will you make me a helmet/are there other replicas you're willing to sell? A: No. Many people have noted that in the background of several shots you'll see multiple helmets and blank castings. Some of these are even chromed. Over the course of this build, I've taken orders for blank copies in order to fund the remainder of the project, as it is an expensive piece to finish. The rest of my money goes towards rent and bills, so this hobby needs its funding from somewhere. As for the other chrome ones, those are duds from the chroming process. They're deformed and therefore unfit to sell. 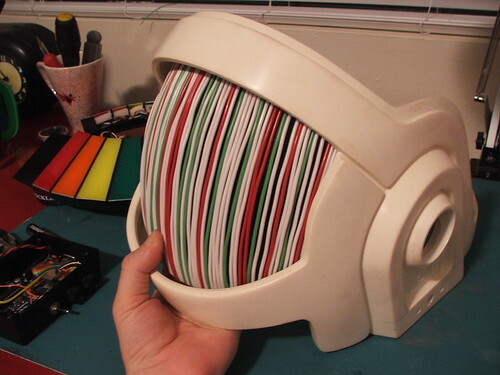 Q: Will you make/Have you made Thomas' helmet? A: A Thomas helmet is currently in the works, and you can use this FAQ as reference for that project as well. There are only a handful being produced, and they have owners. Q: Can I buy a raw cast from the mold to make a helmet on my own? A: Currently, no. I'm hesitant about taking on a lot of "blank" orders, as I do not own reproduction rights for these pieces. As I said before, helmets are only sold when I need funding for the project. Due to this, they are few and far between. Q: Can I have your schematics/plans/illustrations/research notes? A: On some scale, yes. My schematics are included in my client's budget; this is the case with all of my builds. Their payments cover the time in research and drawing of these plans. If you like, I can provide you with hi-res .eps, .pdf, or .ai files to help you in your build for a small fee. Keep in mind that typically these blueprints are the result of several hours of research and planning, then even more time drawing. The electronic boards and diagrams are not for sale, however. This isn't due to any proprietary thing, they're just a huge mess and very specific, and I don't have time to run tech support for people that want to buy them. To save us all some headache, I've just decided not to release the files. If you're interested in the Arduino code used to generate the patterns on the helmet, please check out James Moss' website here. James is a programmer and web developer in the UK, and the extraordinarily talented guy responsible for the illumination control of Guy's helmet. He's released the code for public download to anyone who wants to take a crack at it! I hope that answers some of the questions I've been getting about the helmet, and I truly am appreciative of all the attention its been getting. If I had the ability to make one for every person who has asked, I would! However, I am only one guy, working in his spare time at home. I can't possibly take orders for dozens of replicas, and I'm just plain uneasy about booking out time way too far in advance. To everyone who has asked me about these replicas: Thank You for your interest and your support of my work! Again, I really wish I could help out all the people who have sent me inquiries, but one guy can only do so much. I'll explain all of these in the next entry of the Daft Punk helmet saga; Part 3: Electronics! What are you using to secure the helmet to the head? I used velcro, but I was in need of a quick fix. The background music to the video you posted is a sample from their Tron 2.0 soundtrack right? How did you get it? Awesome job on the helmet btw! According to The Daily Swarm production cost of the original helmets was $14 000 each... Good luck! Hi, I was in the effort of modelling a 3D helmet for an Ad. I would like to ask you if you could permit me to use your blueprints. You could send me them at gabrycir@hotmail.it . Your work is incredible, I've never seen so much effort put in these project and such flawless results! Keep it up! Holy Crap! I am a humoungous Daft Punk fan, and I gotta say the pure white version looked amazingly cool. I hope you can post a video of you wearing that with lights in it. It would pretty much make my entire year. Wow man, that a big help you gave me with the sculpting. I make masks and prostethics, and when I am sculpting I always used oil based clay(which is expensive) I went to the DIY-shop and bought a bunch of cans(? I don't know the English word) of expanding foam and it works pretty good, it is a different sculpting technique but its the end result and the price for the customer that counts right? Thx a lot, I haven't learned this in school and allthough for some project I still will use clay, but for the rough work its going to be the foam! ps: Have a nice wedding and thanks again. Thank you SO much for taking the time to post your progress! You're first post inspired my buddy and I to make ours for next halloween and I've been studying your techniques and progress religiously! Again, thank you! And best of luck with the final product, I can't wait to see it! SIMPLY AMAZING!!!!! The work you've done thus far is astonishing. I'm a huge DP fan. As you mentioned earlier, I'm interested in the blue prints and a white resin mold for purchase. Would you mind emailing the pricing? Oh man I can't wait for the electronics post. I've been dabbling lately but since I only know physics and not engineering I'm full of fail. That's some truly spectacular work, as usual. I'm awestruck. Hey! Amazing Helmets and Congratulations on the Wedding! I just got married spring, however my wife is a Daft Punk Fanatic, if you could give me a price for the raw cast helmet and and the Blue print files and the rest of the files that would be great. Instead of "gold" vacuum metallizing, try Spectra Chrome. sprayonchrome.com/index2.html They have a wide range of colors and they all look like shiny metal, not the typical "metallic" paint. I saw this on a SEMA show special on Speed Channel. With your electronics expertise, I bet you'd find it fairly easy to build a rotational molding machine to cast the helmets. You'd have to make another piece to close the bottom of the mold and attach mounting points to the mold to hold it into the 2-axis rotator. Rotational molding of catalyzed resins is becoming a big thing. Originally it was developed (and still extensively used) for making hollow castings of thermoplastics, usually polyethelyene, by spinning metal mold inside giant ovens. With a catalyzed resin, no oven is required. if you could send me your blueprints i would be more than appreciative. You said I'd have to pay a small fee? Just let me know how much. E-mail me with all the details at jeffchao23@gmail.com. Thanks in advance! Good Job, you do some amazing work! what is the price for a raw cast helmet? Love your work!!! 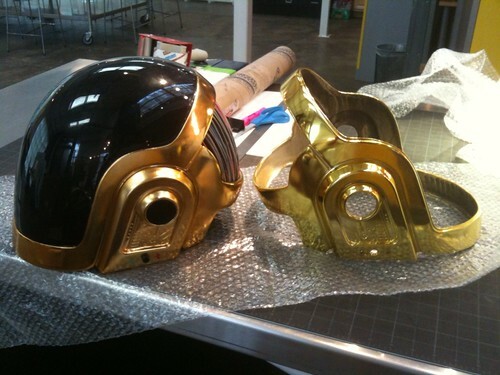 I would like to get both Daft Punk helmets from you.. Very serious.... contact me at djmtx@yahoo.com Thanks, M.
Your work is amazing to say the least! I am quite the perfectionist myself but your attention to detail is outrageous! I plan to go into the Industrial Design field (I am a High School Senior) and understanding processes like the ones you used are essential in that field. 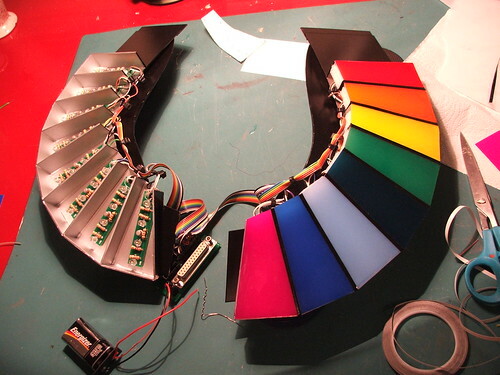 I am looking to make one of these myself and was wondering how much it would be to get the blueprints or other knowledge of yours on this project? I don't exactly have accesss to some of the resources you do (high quality resins, vaccuum forming machines, etc.) so I was wondering if you have any ideas of how I could accomplish something like this project without those things? it si for my advanced atr school's senior spring show so any help is greatly appreciated! my e-mail is tourrr30@gmail.com. Thank you and keep up the amazing projects! Hi, I am very interested in this helmet. I would like making him I even but the necessary stuff is binding. I thus wanted quite as my counterparts to know if you thought of realizing a series of helmet and the price. I live in France. wath is the price of no lights helmet????? Ok... Lets answer some questions! "No, this helmet was built for a client of mine and was constructed specifically for him. Unless he wants to sell it (not likely!) it is not available for purchase." • Raw casts are $250, though I'm not making many more. Time to move on eventually. • The helmet will be held in place with motorcycle-style helmet padding. • If you're interested in the blurprints, I sell these for $5 a piece. Guy's helmet will come with the glove and ear piece blueprints as well. Contact me at volpinprops@gmail.com for more info. • To the guy who said 3D printing and injection molding would be easier, you're insane and have no idea how much that process costs. We did some photos you and I at D*con09, I had the thomas, and you had one of the flawed pressings of this helmet. I put my Thomas build on hold since last D*con. I dont like doing the con in helmeted costumes anymore and doing something else this year, but if you are bringing this to the con (and I dont see why you wouldnt). I will dust off my Thomas one last time. I'm wondering if some people on here want to start a group and build of some of these helmets together? I think it would definitely help jump start things if we could work together. Also, from a quick look at your circuits, it seems like they could be optimized to cut down on the number of resistors, or at least consolidate them and use a DIP package or something. Awesome helmet though, super jealous! How much would you probably be charging for the helmets so i can save up by the time you take reservations again. May i please buy a raw cast? i know in april you said you wouldnt be selling many more anymore. i just hope im not too late. This whole project is outstanding, but at least to me the shaping and molding you did to get you to the raw cast is the biggest trial and error. and id love to work on my own in some way ha. Your work is amazing and congrats for your wedding! Amazing work! And congrats on the wedding. Are blueprints still available to buy? Also, you mentioned back in April raw castings were $250 but that you weren't selling any more of them. Is this still true or do you have any more for sale? Thanks for your time. Hi, i want to make one of those helmet so bad. I noticed that it caust so much to build one....so can you send me the cause of each part and the names of the substance and where i could possibly get? if you cant tell me every thing tell me the parts you could share with me. please. I would love to be able to purchase one of these!!! I'm so disappointed you haven't sent this out to a real manufacturer somewhere; it would be so easy considering all of the work you've done to program and build and print pcb's devise Arduino circuits, you'd make thousands! Maybe just sell the resin kits via a supplier and sell the Arduino software and pcb board schematics as a kit so individuals can have them printed individually. For over seven years I have drooled over the idea of having a real working Daft Punk helmet for Halloween and parties... Oh, I would also pay for disassembled and unpainted components; I can't express how badly I myself and many others would love to own one of these!!! btw, Arduino now has a fabric microcontroller, have you thought of making a light suit to compliment this helmet? Hell, you could even device a way to plug your phone into your jacket with this technology and talk into your sleeve... 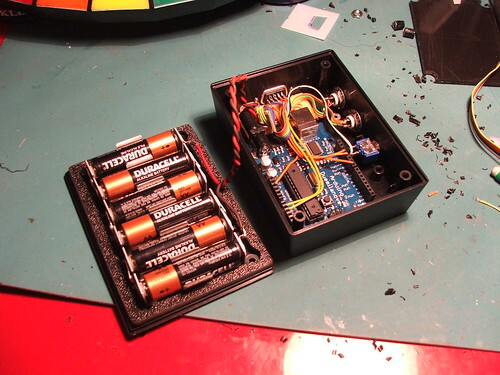 I love Arduino! Viva Italia! Hi, I admire your work, and Im huge Daft punk fan. Can you send me your schematics? Why did you keep coloring it red and gray repeatedly? it kinda confused me. and how did you make a replica of the mold out of metal? Hey there, firstly, great work on all your projects I love the attention to detail and your openess to share your methods with us. I've recently started my own build in order to have it for halloween next year. 1) Did you ever consider putting led lights throughout the front, like the actual helmet has it. I understand this would have been a massive undertaking, and much more complex and expensive. 2) If you did, what were the immediate problems you ran into, and caused you to decide to stick with the led-less visor? I'm not even sure if you could buy that quantity of mulit-color led's. Maybe you contacted the company that was commissioned to create the original helmets LED Effects, if so were they helpful at all? sometimes i wish i had superheroe's powers, like superman's. but would be fine just be human like batman or you. why not showcase this at our NAMM 2011 booth? What is your fee for the schematics? where is the plane of electronic circuit? Your work is great! I originally saw it whilst browsing the internet and it inspired me to do something similar. I was hoping you could email me the schematics of the project, as I wish to embark on something along the same lines for my my final piece in art at school. Great work on the helmet. Iam now making a helmet of my own and was wondering if you could point me in the right direction on getting the right electronics like you used in yours? Would be alot of help thanks. This is amazing! How much for the schematics? I definitely want to try to make one myself, despite the overall cost. I'm a bored design student with a goal now. Dittos, I'd love to see blue prints too, as I would like to build a helmet for Halloween this year!!! Cheers!!! Hello. I really think all your work is fantastic!!! Love this head and the portal gun and the laser rifle and the big daddy suit and... Wait. I mean I love all of the stuff you do. Keep it up. And by the way. I'm a really big deadmau5 fan and want to make the mau5head but cant figure out how? That's why I wondered if u could try making one:P It had been fantastic!!!! Helloz I have been looking threw all your work and they are just EPIC !!!!!!!!!!! and id love to able to build my self a daft punk helmet and id just like to ask if you have building guide for making them to follow ? just like to here your advise I rely hope to here from you soon keep up the grate work!!!! I like your outlook on the creative process. Artists rarely get into it for the money and some people fail to understand this sometimes. I'm interested in undertaking this build. If you would be able to email me at dottyiscool@hotmail.com - how much it would cost for the .pdfs. Also, as a quick question, how do you split the mastermold and the silicon mold? Do you cut it at the seam? I was wondering, since the visor is so similar to tali's if you'd be willing to sell just the vacuum formed visor? I understand that your busy and don't want to make a pain out of your hobby, so I'll understand if you decline. where can i find those gel sheets you used as light filters? If I had a Delorean and one of these helmet I would't need nothing else,seriously,nice job,all your work shows profesionalism keep going! 1 question, how much was spent to create the helmet?